A touring event pairs long-dead Industrial Revolution personalities with living speakers carrying on their work, to spooky and informative effect. As technology journalists, we are frequent visitors to technical conferences and seminars. They tend to be quite similar, even though the range of subjects they cover varies widely. But this week’s event, at the sparkling new Library of Birmingham, had a major difference from all the others I’ve visited: half of the speakers were dead. The ‘xhumed’ event, which is now touring the country, aims to show how the developments of the industrial revolution are continuing to be felt today as their influence shifts to the digital world. To do this, its organisers have paired presentations from current researchers, writers and others with their equivalents from the 18th and 19th centuries, reanimated in various ways: as projections, voiceovers for films, animations, good old-fashioned portrayals by actors, and in one case, a giant mechanical disembodied mouth. It’s quite an eerie experience to be addressed by HG Wells, in his own words, as a projection onto the face of a dummy whose physique is far more imposing than the short and slightly tubby Wells, but the author’s prescience about the developments he saw from the early 20th century are somehow even more marked in this format. And it seemed very fitting to hear from some of the members of Birmingham’s Lunar Society, a loose confederation of scientists, industrialists and philosophers who were at the centre of the industrial revolution, in their own city. Mass production pioneer Matthew Boulton, for example, was resurrected in the form of a 3D printed figure, whose production we were talked through, and which then — rather spookily — became an animated figure, addressing the meeting about how the ability of 3D printing files to be transmitted digitally could change the industry which he himself had helped found in the 18th century. I was slightly disappointed that nothing was made of Boulton’s other great contribution to the Industrial Revolution — his business partnership with James Watt, which was instrumental in the development and spread of steam power in industry and later in the railways. Other presentations were more apposite: the reanimated Joseph Priestley, dissenting clergyman, educator, co-discoverer of oxygen, inventor of fizzy drinks, friend of Revolutionaries and victim of politically-inspired mobs, popped up through the medium of Twitter and attempted to start a ‘Twitterstorm’ by taking against bicycles in cities. Now there’s nothing new about dead people on Twitter. My own Twitter feed includes dead people (Samuel Johnson), fictional people (the nerdily amiable cast of the webcomic Questionable Content by Jeph Jacques) and one dead fictional person (the formidable Leo McGarry of the West Wing) but trying to get a dead person, using their own words from the Library’s archive, to exert real influence on the present is another matter, and I’ll be interested to see how much success @JPriestley1733’s living controller, local author, social media expert and broadcaster Jon Bounds, has in stirring up twitterstorms as the event goes on. Incidentally, he measures the intensity of such storms on a scale named after another Midlander, journalist Caitlin Moran: 0.3Morans is an article on Buzzfeed, 0.5Morans is a column on the Guardian’s website, 0.7Morans is a point-missing, hate-filled diatribe on the Mail Online, and one Moran is a piece on Newsnight. Our efforts this week maybe made a few milliMorans. Could do better (or worse, depending on how you look at it). 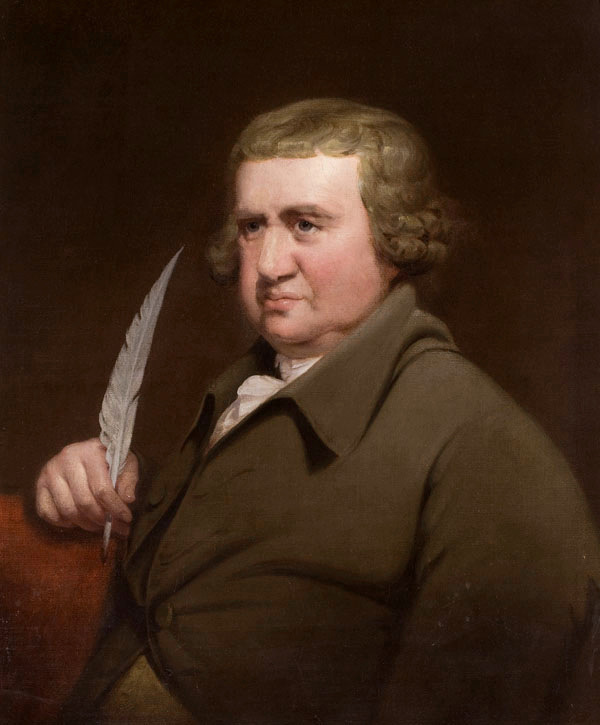 Particularly interesting was a presentation based on the work of another Lunar Society stalwart, physician, poet and natural philosopher Erasmus Darwin (grandfather of Charles). Among Darwin’s many achievements was the invention of a talking machine, with a mouth made of soft leather, vocal chords of stretched silk ribbon, and breath provided by bellows, which he designed to demonstrate the mechanics of speech and his own ideas about how this influenced the development of the alphabet and language. 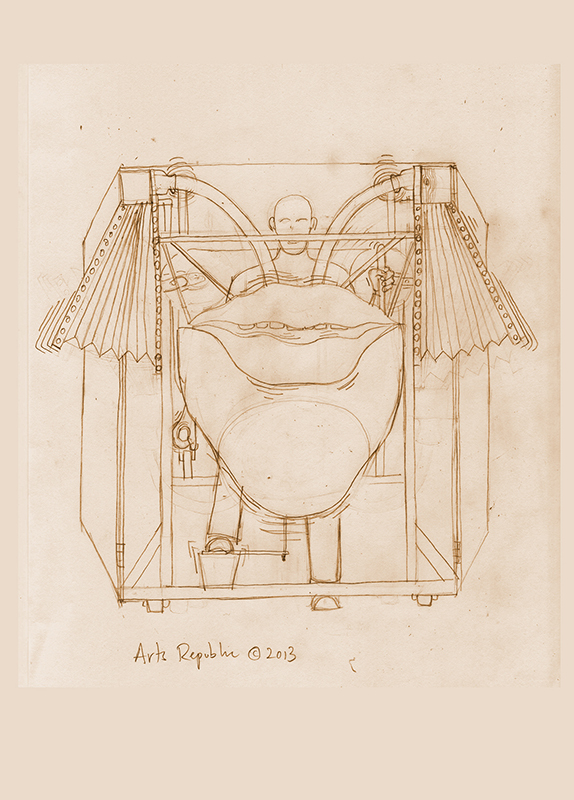 It was a scaled-up version of this — six feet tall and with a mouth about three feet across — which accompanied a voiceover in Darwin’s own words, although it wasn’t readily apparent whether the machine was speaking ‘live’. This ‘talk’ was acccompanied by a presentation from Christophe Veaux of Edinburgh University, who put Darwin’s work into the context of the development of speech synthesis and brought us up to date with his own work on reconstructing the voices of those who have lost their own, due to neurological disorders such as motor neurone disease or stroke, cancer or injury to the vocal tract. Perhaps the most successful part of the event, this introduced me to the concept of ‘voice donation’, an essential facet of voice reconstruction when the patient has already suffered voice damage when diagnosed — something very common in the case of MND. It’s something I’ll be looking into myself, especially as voice loss has affected my own family, and perhaps gave the clearest demonstration of direct descent of thought and technology from the Industrial Revolutionaries to the present day. Slightly less relevant from an engineering point of view, but still interesting, were talks on the value of voluntary work, from the late Geraldine Cadbury, one of the first female magisrates and a pioneer in the treatment of juveniles in the Criminal Justice System, and Helen Milner, CEO of the Tinder Foundation, which helps the elderly and disengaged to access the resources of the internet; and a distinctly disturbing address from the shade of outspoken atheist John Baskerville, who against his clearly-stated wishes was exhumed, exhibited and reburied three times, accompanied by a talk about the digital and physical rights of the dead by John Troyer of the sepruchally-named Centre for Death and Society of the University of Bath. Inevitably, that spectre of scientific progress, Victor Frankenstein and his monstrous creation, reared their ugly heads, via a presentation from their own creator, Mary Shelley, whose image was effectively mixed with that of the False Maria robot from Fritz Lang’s film Metropolis, and a talk from science writer Jon Turney, touching on the convergence of machine and human memory. This last struck a slightly false note for me: although Shelley must have been irresistible to the organisers, she was influenced much more by scientists like Faraday and Davy than by industrialists. Maybe early cosmologist Catherine Herschel or utopian writer and scientist Margaret Cavendish might have been a better match. Overall, it was a memorable, entertaining and informative afternoon, which is probably the most you can wish for, but I was left wondering exactly who the event was intended to address. If it’s younger people, it needs better introductions; I’m the sort of dull person who knows who Erasmus Darwin et al were, but it’s not exactly common knowledge. But it certainly helped to increase the impact of the contemporary speakers. Maybe we should consider an address by the late IK Brunel or George Stephenson — or Messrs Boulton and Watt — at the next Engineer Conference. Did they not mention Richard Trevithick? If not then this is also a continuation of the efforts by Boulton and Watt to discredit him. Watt was in reciept of substabtial royalties based on the improved efficiency of his machines over the basic Newcomen engine and saw Trevithick as a real threat. As a result he spread many unfortunate rumours, such as the inappropriate use of cast iron for high pressure boilers (it was wrought iron) and famously stated that Trevithick should be flogged for releasing something so dangerous on the world. As the shrinking of the steam engine by use of high pressure was what really kicked the industrial revolution up to full speed, Trevithick is incredibly important but, sadly, his contribution is usually not fully grasped. What his innovation gave us was a prime mover with a specific power output sufficient for transport. This facilitated the modern railway, the private car (via the early 19th century steam carriages and note that until the 20th century was well established the jury was still out on whether petrol, electric or steam was the best solution for this application). It also allowed small workshops to be powered. Small wall mounted steam engines were even used by clockmakers to power lathes etc. I do not wish to denigrate any of the figures who were represented but the common omission of Trevithick begins to look almost like a crime. let Einstein be”, restored the status quo. Each of the individuals you describe -ancient and modern- have made it their life’s work to untangle some small part of Nature’s Laws: laws that ever were (and are) just waiting for some one with the education, training, ability and drive necessary to make that small step forward. The Industrial Revolution [I actually prefer R-evolution -(the R standing for rapid) lifted mankind -at least technically- from the Dark/Middle ages into that place where, as Voltaire suggested, all innovation should aspire: ‘the greatest good to the greatest number’, and who can argue with that? Those who constantly look backward for precedent, rather than forward with and for inspiration. Those who benefit from what is the now, rather than what might be: from a continuation of the present rather than a step into the unknown future. I am constantly amazed by the fact that most of the stops to technical advance are self-(or at least leadership?) imposed -and that as Engineers, scientists and technologists (and journalists) we still allow it. Shall we overcome? I hope so for the benefit of my grandchildren and yours! “as Voltaire suggested, all innovation should aspire: ‘the greatest good to the greatest number’, and who can argue with that? The figures discussed in the article were all challenging the status quo with both guts and intellect. Is this not an extremely good precedent from the past and exactly what we should strive for now? I also struggle with the concept of precedent/inspiration from the future…. Where do I get my time machine? (or, more philosophically, when?). I was/am once again taking a poke at those -who whilst apparently the leaders of our society (in post, position and power) constantly look backwards for precedent…and so on. I am as so often referring to lawyers, and other sham professionals: and doing so following 40+ years of testing the bas*ards to demonstrate just (an inappropriate word in their orbit) what they can get up to! The great Engineers, scientists, technologists and so on -like those mentioned in our Editor’s article- are (as I trust I have been throughout my career) always first to question, to challenge, to seek a better way. Did any lawyer do the same? Not often in my experience, and even then only if there was more money in it for them! More to follow directly if appropriate: my personal e-mail is mikeblamey@yahoo.co.uk and will be delighted to describe my researches -including defamation, patents, employment and commercial law and the manner in which I set out to complete my work. Jonathan might enjoy this blog, in reply to our Secret Blogger last week! Whilst I may not be in my prime physically, I hope that my mental capacities are still right up there with the best! The one group which for some reason SB forgets to mention is solicitors. The junior lawyers, who have called their ‘trades union’ the Law Society -presumably to give it some legitimacy. Interestingly, this group swears no oath on appointment (unlike most others in the legal pile) but are apparently ‘officers of the supreme court’ by some intellectual slight-of-hand or procedural trick. Call it what you will, but an oath, affirmation, confirmation of one’s professional status and responsibilities (and separation from simple commerce, money-making) is surely essential for all who are paid by society for brain, not brawn. Indeed many who are paid for brawn can still aspire to be professional. It is to establish the extent of the weaknesses in solicitors’ (and other shams) professional misconduct that my 40 years of academic research has been directed. I believe its publication -in one of my prime years- will make several steps towards placing our earned status as Professional Engineers above those claimed by lesser persons and characters. Mike: I think that we are in violent agreement! As a part of my research, I did look into the systems in place to monitor and control/discipline lawyers. As an Engineer, I was particularly interested to note that the Solicitors Complaints Bureau (now called something else) was set up some 35 years ago following a complete failure on the part of the Law Society to initially look into the affairs and gross misconduct of a lawyer: who was acting for an individual Leslie Parsons, an Engineer who’s ideas for an onion pealing machine [I kid you not!] had been ‘borrowed’ by a large competitor. Parsons knew that he was being poorly advised and overcharged by his solicitor who was a family friend: but it was only when he noticed that on his bill for work done, was several hours time: covering the period of his solicitors attendance, as a guest, at Parson’s daughter’s wedding! that he knew the possible extent. Pinch yourself, it happened! I saw my role as a worthy(?) follower in Parson’s footsteps. And have deliberately ‘set-up’ a series of lawyers to see just how far ‘up’ the lawyers pyramid the rot has set-in: and the extent of the cover-ups that are made. If I tell you, almost to the very top…be as irritated as I was. Wasn’t there some Greek fellow, who given what seemed an impossible task -the shifting to much ‘horse manure’ from some King’s stables- realised that he could not shovel such individually, but diverted (he must have been a civil Engineer) a near-by river through to wash the whole lot away? I plan a similar exercise.